Search results for "NYC Department of Housing, Preservation and Development"
From coast to coast, micro-apartments are all the rage these days. Right on the heels of announcing the winning design team for its first micro-apartment competition, the New York Observer reported that the New York City Department of Housing Preservation and Development (HPD) Commissioner Matthew Wambua told a crowd at the Citizens Housing Planning Council yesterday that the city is already scouting out two or three city-owned sites for its next micro-unit development. Once these locations are identified, the HPD said it will put out requests for proposals. The winning team of the city’s adAPT NYC Competition consisted of nARCHITECTS, Monadnock Development, and Actors Fund Housing Development Corporation. This will not only be the city’s first foray into micro-apartment development, but it will also be one of the first projects in Manhattan to use modular construction. 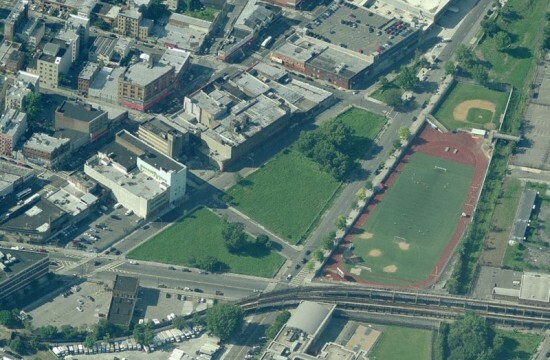 With his time in office coming to a close, Mayor Bloomberg is moving swiftly ahead with his administration’s affordable housing plan, and calling on developers to submit proposals to build on the last sizable stretch of vacant city-owned land in the Melrose and HUB area of the South Bronx. The NYC Department of Housing Preservation & Development (HPD) is overseeing the Bronxchester Project, and yesterday announced a Request for Proposal (RFP) to develop two parcels into affordable housing and mixed-use space. In the last decade, a wave of new affordable housing developments have taken root in Melrose, a neighborhood destroyed by the arson epidemic in the 1970s and then essentially deserted in the 1980s. “Not long ago it was a rarity to see new affordable homes being constructed in a neighborhood littered with abandoned buildings and rubble strewn lots. What we now see are thousands of new affordable homes and apartments that have laid a foundation for stability and growth in this community; today this is the new normal,” said HPD Commissioner Mathew M. Wambua in a statement. The Bronxchester Project will join other like-developments, such as the Grimshaw-designed Via Verde housing complex and the sprawling Melrose Commons Urban Renewal Area, which has added over 2,800 residential units to the neighborhood. The parameters of the project are fairly flexible: Developers have the option to submit proposals for one or two parcels, but must include mixed-income housing, open space, and commercial space or a community facility. The RFP deadline is July 3, 2013. It will now be increasingly difficult and costly for New York landlords to flip properties by making quick fixes to buildings that require major structural repairs and improvements. The New York City Council passed a bill yesterday that will allow the Department of Housing Preservation and Development (HPD) to clamp down on landlords who don’t “repair underlying conditions that lead to repeat violations” stated the City Council in a press release. These violations could include leaks or damaged roofs that lead to mold, which could have a deleterious effect on a tenants “quality of life, health, and safety.” The new legislation will give the owner a four-month period to take the proper measures to fix the problem and provide proof of their compliance. Landlords could face penalties of $1,000 per unit or a minimum of $5,000 if they fail to comply with the order by deadline. While private landlords will be reprimanded for failing to comply with orders by HPD, the question is whether the New York City Housing Authority will also be held accountable and required to pay the same penalties if repairs aren't made. NYCHA claims that there were no “serious structural issues” caused by Hurricane Sandy, but tenants disagree and say the storm revealed a plethora of problems such as cracks, leaks, and loss of hot water. This summer, the Daily News reported that NYCHA board chairman John B. Rhea revealed a “backlog of 338,000 maintenance orders.” City council conducted a report with help of the Boston Consulting Group, which disclosed a study that kids in public housing are "three times more likely to develop asthma as those in private homes." NYCHA might not admit that the repairs constitute major structural issues, but the evidence of these health issues certainly contradicts this claim. Tenants with repeat mold problems have filed a suit against NYCHA for violating the Americans with Disabilities Act citing asthma as a disability. 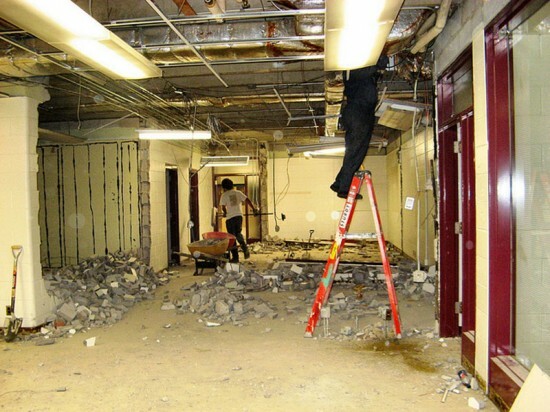 We’ll see if this new bill will compel NYCHA to expedite these maintenance orders. TEN Arquitectos' 32-story tower viewed from the corner of Lafayette Avenue and Ashland Place. 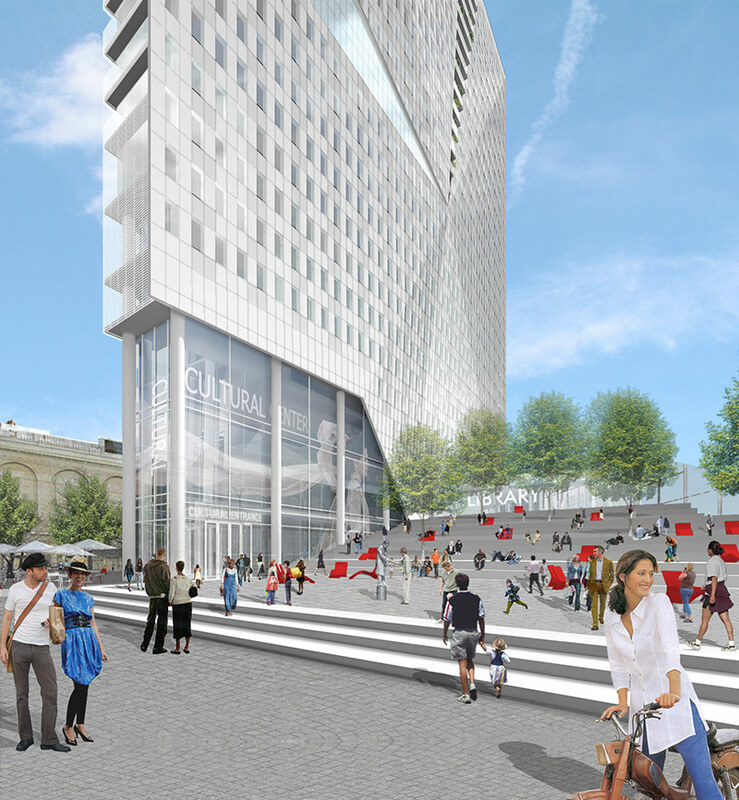 On November 28, Mayor Michael R. Bloomberg announced milestones in three projects that will bring affordable housing and additional cultural and community space to the last city-owned parcels in the Downtown Brooklyn Cultural District. First, the Gotham Organization and DT Salazar are partnering with City Department of Housing Preservation and Development (HPD) to develop a 515,000-square-foot mixed-use building on a site bounded by Fulton Street, Rockwell Place, and Ashland Place. Second, Two Trees Management Company has initiated the public review and approval process for a 32-story mixed-use facility designed by Enrique Norten of TEN Arquitectos on Flatbush and Lafayette. Finally, HPD released an RFP for the last development parcel in the district, located at the intersection of Ashland Place and Lafayette. 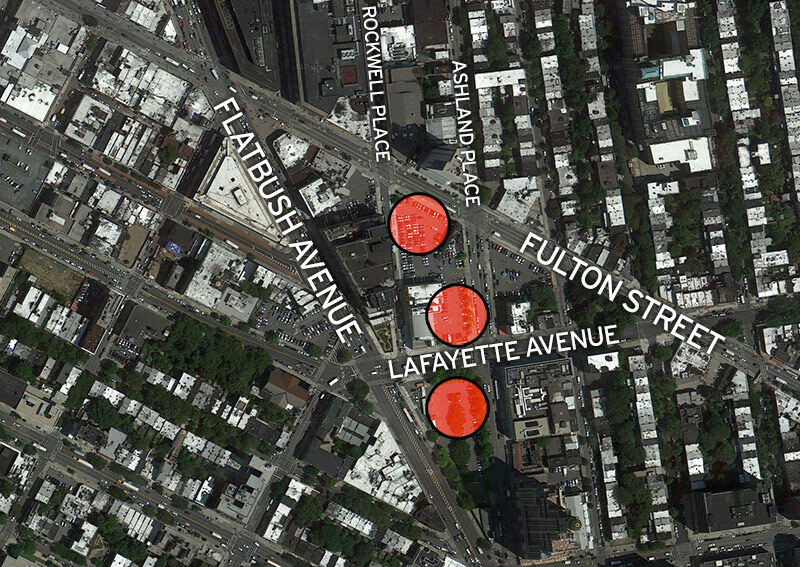 Three parcels in Downtown Brooklyn are targeted for development. HPD has finalized plans with the Gotham Organization and DT Salazar to build 600 units of new housing, 50 percent of which will be affordable and 40 percent of the affordable units will be two-bedroom units. When completed, the building will also contain 20,000-square-feet of cultural and related office space and 20,000-square-feet of retail space. HPD and the NYC Housing Development Corporation (HDC) expect to close on financing with the development team late next year and to see construction begin shortly thereafter. The Gotham Organization has not yet announced the architect of the project, which has just begun design development. 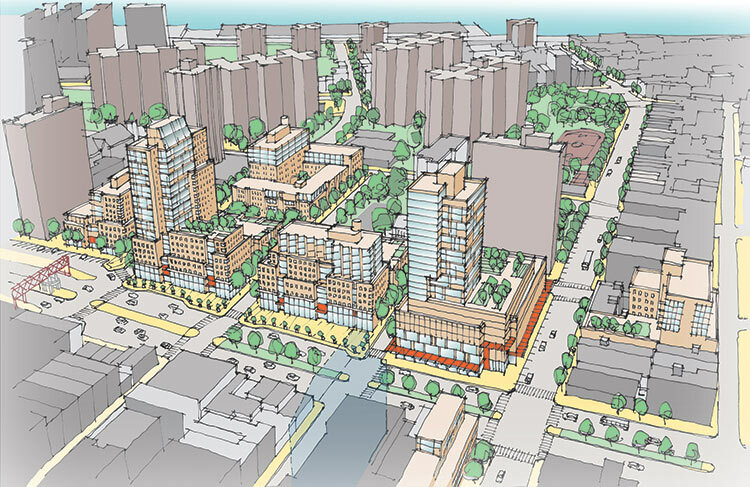 Two Trees, which agreed to purchase the district’s South Site parcel from the City’s Economic Development Corporation in 2009, began the City’s Uniform Land Use Review Procedure (ULURP) to gain approval to build a new mixed-use development on the Flatbush Avenue site. The approximately 47,000-square-foot lot, which is bounded by Flatbush, Lafayette Avenue, and Ashland Place, is currently a parking lot owned and operated by the New York City Economic Development Corporation (EDC). 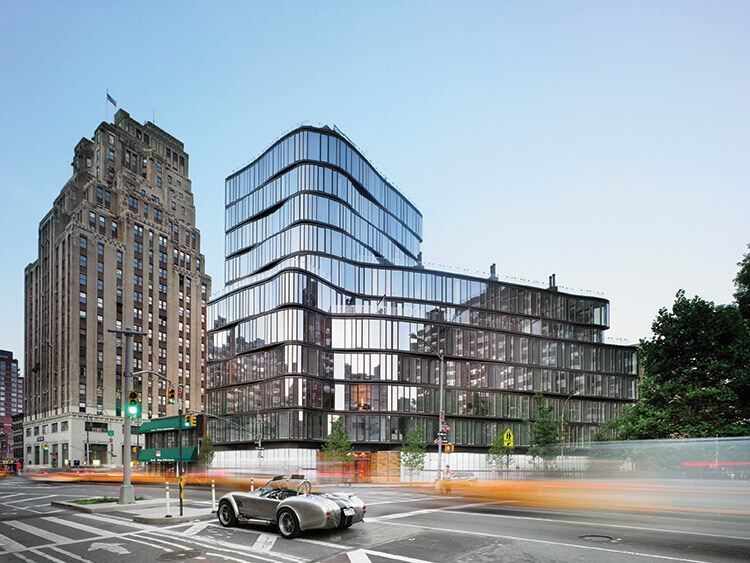 Once the ULURP process is complete, and approvals have been granted, Two Trees can begin constructing the Ten Arquitectos highrise, which includes approximately 50,000-square-feet of creative and cultural space that will be shared by BAM, 651 ARTS, and the Brooklyn Public Library. 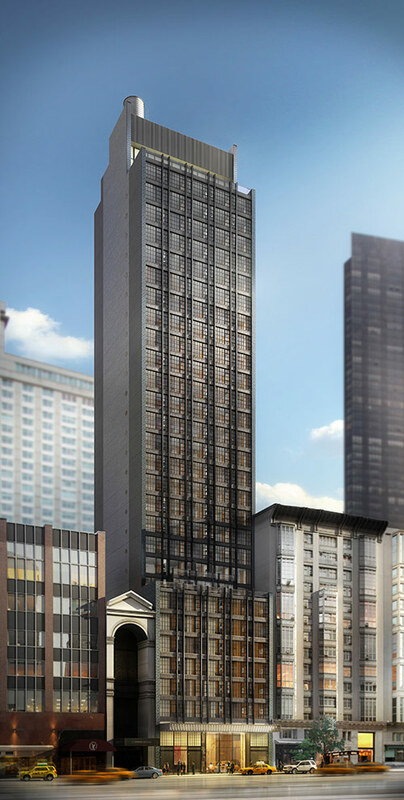 In addition, the tower will include approximately 23,000-square-feet of ground-level retail, as well as approximately 300 to 400 apartments, 20 percent of which will be affordable. 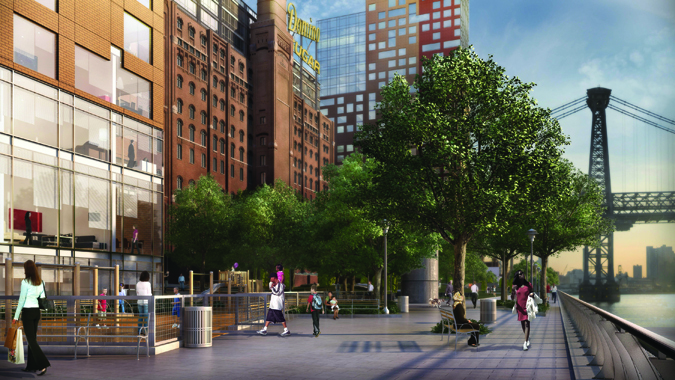 A plaza along Flatbush Avenue will sit adjacent to Enrique Norten's tower. Plans for the site also include a 16,000-square-foot public plaza programmed for a variety of outdoor uses, including dance and theater performances, film presentations, open air markets and crafts fairs, and other community uses. Once the facility is complete, the 50,000-square-feet of cultural space and a portion of the public plaza will be controlled by the City of New York. Approximately 17,400-square-feet of space will be occupied by BAM to allow the institution to meet the needs of its growing audiences. A component of this expansion will enable the academy to make its BAM Hamm Archives Center resources available to the public, providing researchers, artists, educational institutions, and students with access to materials and records documenting the oldest performing arts center in the country. The Brooklyn Public Library will use approximately 16,500 square feet of the cultural space to open a new state-of-the-art branch. The new branch will offer traditional library services as well as new technologies and programming that will benefit the local community. 651 ARTS, an acclaimed performing arts presenter dedicated to artists of the African Diaspora, will occupy a 12,500-square-foot studio and rehearsal center. The rehearsal studios will be available at affordable rates, and preference will be given to organizations in the Downtown Brooklyn Cultural District. The state-of-the-art studios will also be multi-purpose space for education programs, and will provide opportunities for live public performances, gatherings, and salons for artists to cultivate their work. On November 27, HPD released an RFP for Cultural District Site II, the last development parcel in the district, located at the intersection of Ashland Place and Lafayette Avenue. The RFP calls for approximately 100,000 square feet of floor area and may include residential, community, and/or commercial space, with a requirement to include a minimum of 15,000 square feet dedicated to cultural space and the arts. If affordable housing is proposed it must serve low-income New Yorkers. Proposals must be submitted by February 1, 2013. For more information and to download the RFP, visit www.nyc.gov/hpd. The Bloomberg Administration is arguably one of the most pro-development governments in city history. Since he took office, the Mayor has used city agencies to unleash the forces of New York real estate while also steering those forces to meet goals for a cleaner, greener, and more equitable city. PlaNYC, the catch-all name for the Mayor’s bundle of 132 sustainability initiatives, creates a framework for over 25 city agencies to collaborate on a vast array of projects, from the new East River Ferry service to a $187 million investment in green infrastructure. While some programs such as MillionTreesNYC, are making streets leafier one tree at a time, many of the Mayor’s initiatives have reshaped the city in profound ways. As the administration counts down its remaining days in office, AN checks in with the individual agencies whose projects have had the most impact on development in the city. By Alan G. Brake, Molly Heintz, Julie V. Iovine, Branden Klayko, Nicholas Miller, and Tom Stoelker. The New York City Economic Development Corporation (NYCEDC) is not a city agency at all but a non-profit with a mission to spur local development, but the Mayor appoints seven members of the organization’s board of directors, including the chairperson. The NYCEDC, which has grown from a staff of 200 to over 400 during Bloomberg’s tenure as mayor, has its hand in hundreds of projects across the city. “Our goal has been to diversify development across five boroughs,” said NYCEDC President Seth Pinsky. And just because Bloomberg’s term is coming to a close, don’t think things are winding down. The Applied Sciences campus on Roosevelt Island is just getting underway and, as of June, the city had acquired 95 percent of the land required to move forward with Willets Point, a five million square foot development that includes the remediation of a contaminated site. Hunter's Point South (left) and Seward Park (SPURA) (Right). Major Initiatives: According to NYCEDC, the Waterfront Vision and Enhancement Strategy (WAVES) Initiative is a “sustainable blueprint for realizing New York as a premier waterfront city.” Under the umbrella of the initiative are 130 projects across more than 500 miles of city coastline. Twelve city agencies are involved along with investment of $3 billion over the next three years. 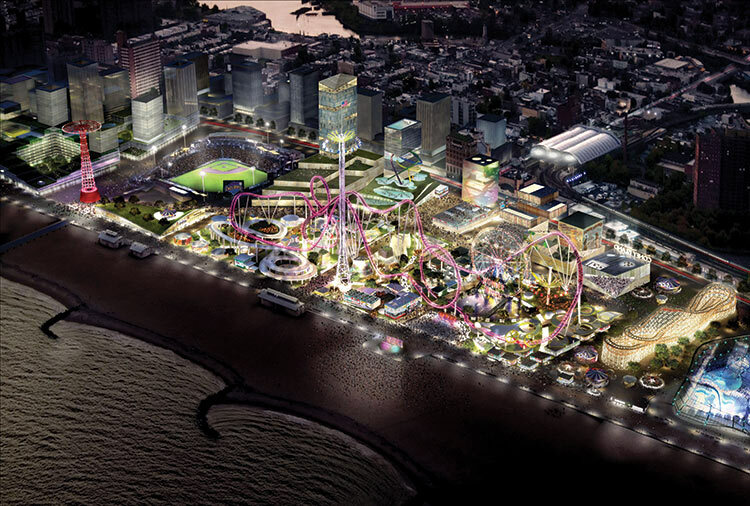 The City’s Coney Island Revitalization Plan calls for a mixed-use neighborhood with 5,000 new units of housing plus retail, an effort the city predicts will generate 25,000 construction jobs and 6,000 permanent jobs. 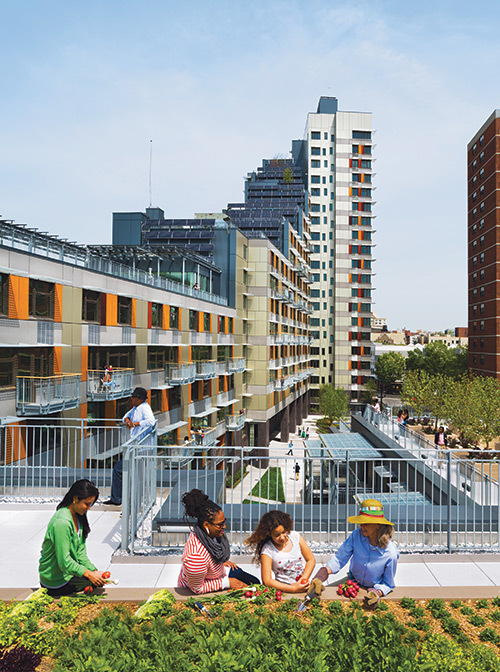 The South Bronx Initiative was launched by the Mayor in 2006 to create a strategic plan to support private investment, development, and infrastructure planning in that area. Working with HPD, NYCEDC developed retail corridors that would support new housing. NYEDC has also increased outreach to communities impacted by its projects. The State says too much, recently citing EDC for playing “a behind-the-scenes role in the lobbying activities” on behalf of Willets Point and Coney Island developments. Status: The statistics on WAVES initiatives are detailed: 34 projects completed; 71 projects on schedule; 14 projects with delays; 5 projects reconsidered; 1 project not yet started. 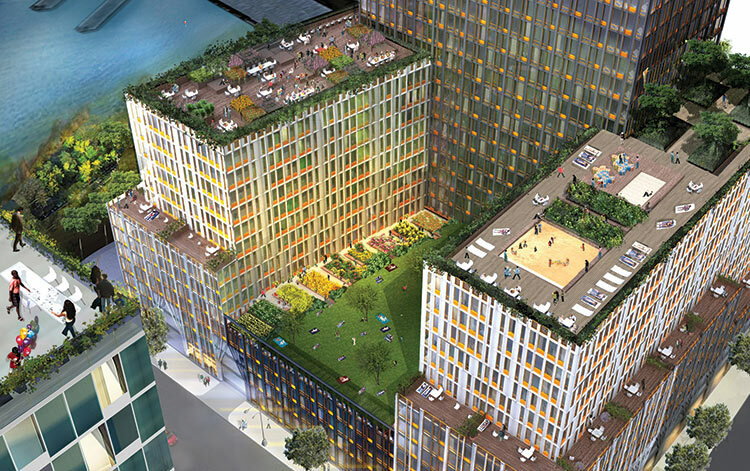 Projects include New Stapleton Waterfront, a seven-acre development on the site of the former Navy Homeport in Staten Island, featuring 900 rental units, retail, and a waterfront esplanade. “The RFP was issued in late 2007, then the financial crisis hit causing us to lose all the original respondents. But we managed to persevere. We found a new developer, Ironstate Development of Hoboken, broke the projects into phases, and rejiggered some of the site uses,” said Pinsky. At Coney Island, before construction can start, the proper infrastructure has to be in place—namely sewers. “A lot of the areas had never had substantial development, and in order to build housing and retail, you need to have adequate infrastructure,” said Pinsky. As part of the Coney Island plan, the City is putting $150 million into infrastructure alone. Major Initiatives: Under the Bloomberg Administration, the Department of City Planning has been more active than at anytime since the days of the Lindsay Administration’s vaunted City Planning Commission. Since 2002, 40 percent of the city has been rezoned (115 rezonings covering more than 10,300 blocks). Under the direction of Commissioner Amanda Burden, the department has adapted for the 21st century many of the initiatives first conceived under Lindsay, including large-scale mixed-use developments such as Hudson Yards (with customized zoning and financing mechanisms for infrastructure improvements) and Willets Point while amplifying community involvement through intensive public-private collaborations—the High Line, South Street Seaport—and enabling coordinated efforts across agencies in order to address sustainability goals and open space and streetscape improvements. 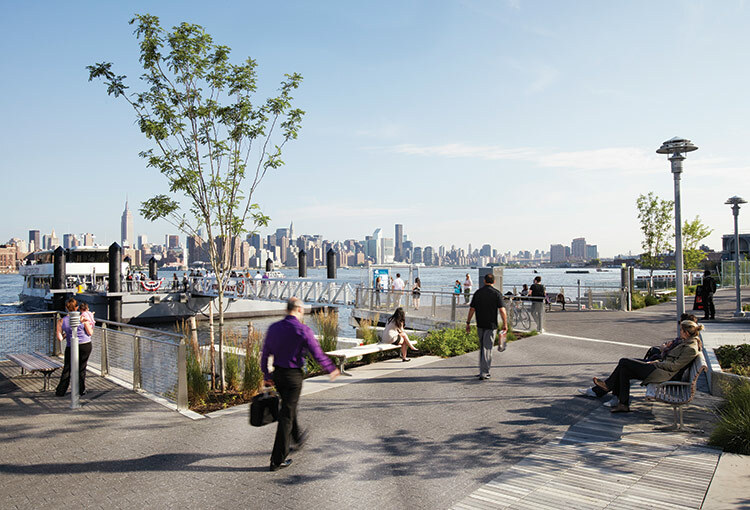 In Greenpoint/ Williamsburg, planning partnered with HPD to structure a new Inclusionary Housing Program along the waterfront, while collaborating with the Parks Department to ensure that the new two-mile waterfront esplanade would remain fully accessible to the public. But it will most likely be the attention to detail that will be remembered most about Burden’s reign, from the creative zoning encouraging cultural uses on 125th Street to the bar-style balustrades along the East River Waterfront Esplanade. Status: Subject to major rezonings, some neighborhoods are already reaping the hoped–for rewards although not always as originally envisioned. A 2004 rezoning of Downtown Brooklyn to transform it into a major business hub has been slow to take off, even as it has triggered a residential boom—26 new buildings; 5,200 units. This summer, the emergence of the Brooklyn Tech Triangle, New York University’s Center for Urban Science and Progress campus, and MakerBot’s move to MetroTech are adding some momentum. The 2005 rezoning of the Greenpoint /Williamsburg waterfronts has added fuel to the ascendance of the Brooklyn waterfront, while rezonings of Bedford Stuyvesant North, West Harlem and the South Bronx will inevitably take much longer to catch on. Attention is currently focused on a big final push to rezone East Midtown and redirect development towards the East Side triggering changes with potentially more impact on the core skyline than anything along the waterfronts. In Williamsburg, developers of the Edge (Below, left) and Northside Piers (below, right) were required to build waterfront esplanades (above) as public amenities. 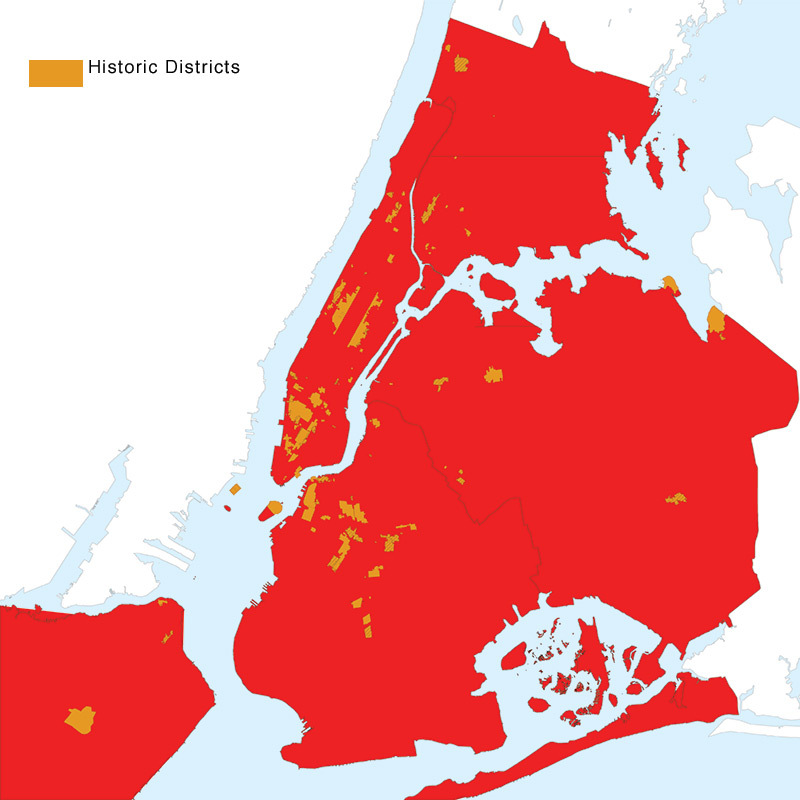 Major Initiatives: New York City comprises 29,000 acres of parkland. Over the past decade, the Bloomberg Administration has added more than 730 acres. While Central Park has long been a major economic generator of funds ($656 million in increased tax revenues in 2007 generated by adjacent properties increasing in value by proximity to the park), increasing riverside accessibility at Greenpoint and Williamsburg’s former industrial sites, Hunters Point South, Hunts Point and along the city’s 520 miles of waterfront have become key initiatives of the administration, and the progress is notable. Commissioner Adrian Benepe has made no secret that the administration’s definition of success lies in creative financing with a bedrock of public-private partnerships. The commissioner pointed to the Central Park Conservancy as the great “friends of” model, but hand-in-glove cooperation with City Planning and the Department of Transportation has reshaped waterfront parks and their upland streetscapes by courting development. Status: There are 160 active capital projects in the parks department. 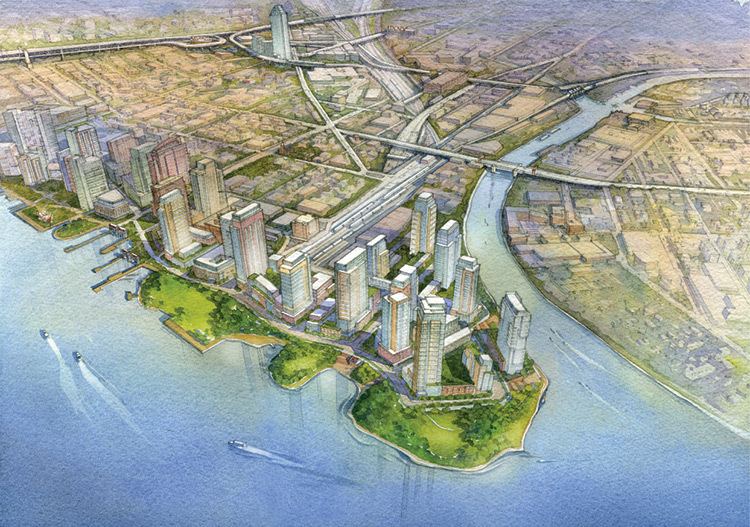 Of several near-term priorities, three waterfront projects are engaging in public-private developer involvement. In Greenpoint/Williamsburg the city is cobbling together parcels to create public parks linked with privately owned pubic spaces (POPS). A 2005 rezoning required developers to build the POPS at the river’s edge in return for substantial floor area ratio increases. The zoning encouraged Toll Brothers to build Northside Piers, Douglaston to create Williamsburg Edge, and JMH to restore 184 Kent. The 30-acre Hunter’s Point South allowed for park designs by Balsley/Weiss/ Manfredi with Arup and residential towers developed in part by Related and designed by SHoP. 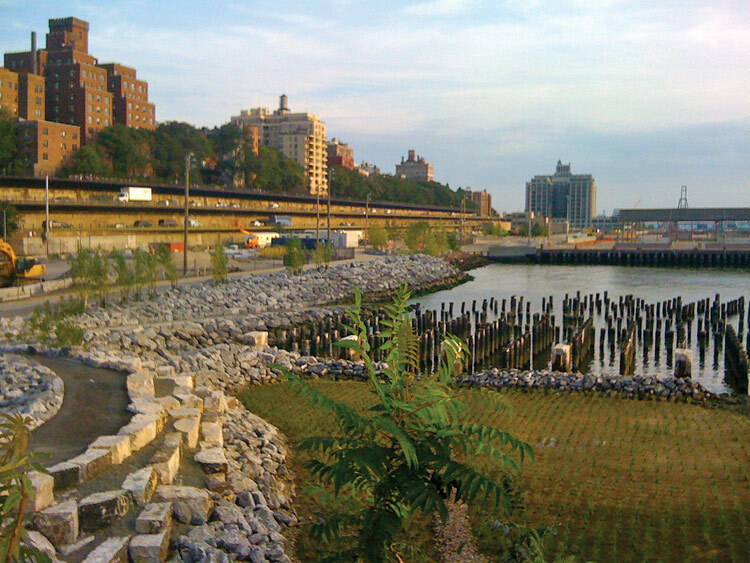 In the Bronx, a grass roots riverside cleanup eventually led the Department of Environmental Protection to supply land for Barretto Park. The city is building parks at Hunter’s Point South to facilitate development compatible with an urban waterfront. LPC has approved both contextual such as St. Vincent’s (left) and contemporary designs like One Jackson Square (right). Though Landmarks has added 31 new historic districts, landmarked structures represent a tiny fraction of the city’s buildings; Click to enlarge. Status: Pre-Bloomberg, there were 77 historic districts and 9 historic district extensions, encompassing approximately 22,400 properties. Currently there are 108 historic districts and 18 historic district extensions, encompassing approximately 28,500 properties. There are 30,000 landmarked sites throughout the city, including 1,316 individual landmarks, 10 scenic landmark sites, and 114 interior landmarks. 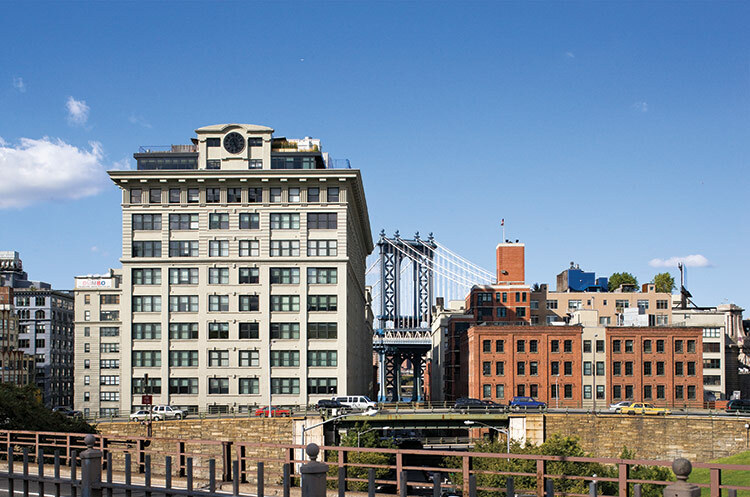 Protected buildings in DUMBO (left) and the new DUMBO historic district (right). 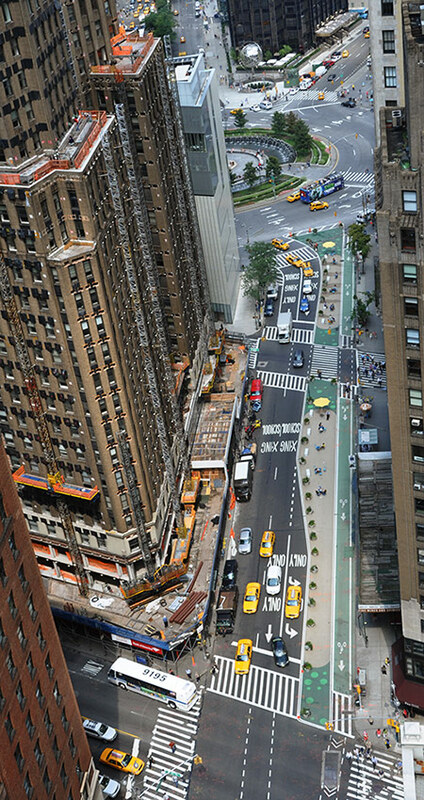 Left to right: Madison Square Plaza; Dutch Kills Green; Broadway leading to Columbus Circle. Status: Recognizing that streets in New York account for 25 percent of the city’s area yet pedestrian amenities were scarce, DOT created Sustainable Streets, a multimodal transportation policy for the city, calling in part for improving streetscapes for pedestrians and cyclists and creating new public spaces from underused roadways in targeted locations such as Times Square, Herald Square, the Flatiron District, and now Vanderbilt Avenue. 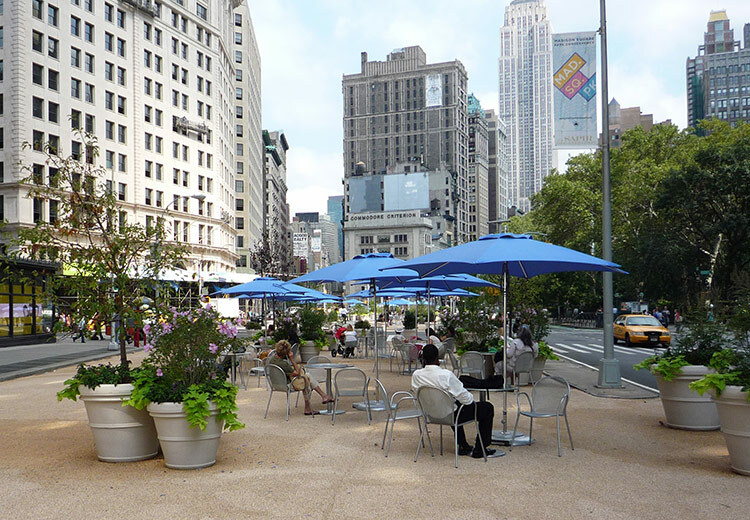 Also in 2008 and 2009, DOT undertook the Green Light for Midtown program to improve the streetscape along Broadway, created new plazas at Madison Square’s iconic Flatiron Building, and built a ribbon of new public space along a new Broadway Boulevard connecting Herald and Times squares. In June the study, “If You Build It: The Impact of Street Improvements on Commercial Office Space,” showed how improvements work together to create a backbone along Broadway. 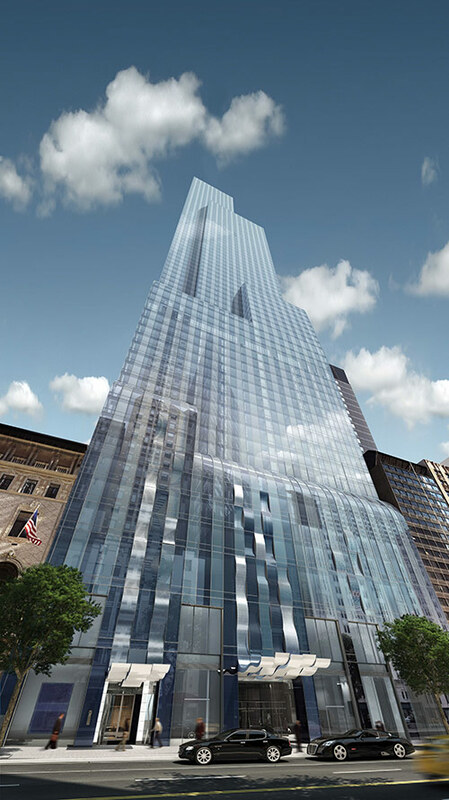 Hotels, in particular, are taking advantage of older building stock. In recent years, the Ace Hotel, the NoMad Hotel, and the Flatiron Hotel have all opened in previously overlooked blocks of Broadway; Marriott plans an Edition Hotel in Madison Square’s Clock Tower Building. Astor Place may be the next hot spot. With over eight acres of new pedestrian space planned there, it is the site for one of the first new spec buildings in the past 20 years. 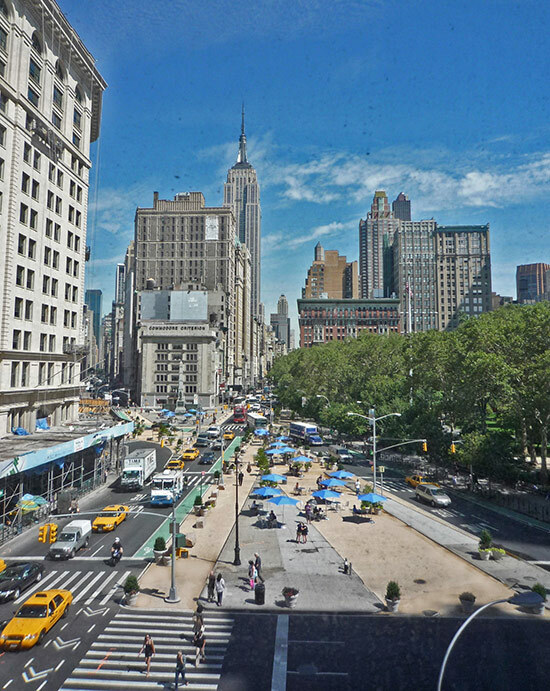 Madison Square Plaza after DOT's pedestrian improvements (left) and the conditions before (right). Major Initiative: The New Housing Marketplace Plan calls for the creation and preservation of 165,000 units of affordable housing by 2014. Status: HPD counts more than 125,000 units towards this goal. By the end of fiscal year 2011, 35% of housing started under the plan was new construction, 65% preservation. The agency has been more successful at preservation of affordable housing than new construction, due in part to the real estate downturn. HPD is currently “getting started on and finishing out” many new construction projects and closing in on construction, according to Deputy Commissioner for Development RuthAnne Vishnauskas. “You will definitely see progress towards getting towards the marquee goal for new construction sites.” Seward Park (now in ULURP) on the Lower East Side and Hunter’s Point South (under construction) in Queens are major new developments that the agency hopes to complete by 2014, each of which will include more than 900 units of affordable housing. Two examples of Blue Roofs. Major Initiative: DEP signed a consent agreement with the New York State Department of Environmental Protection (which enforces federal EPA standards) to comply with the federal Clean Water Act standards, improve the health of the city’s waterways, and dramatically reduce the number of combined sewage overflows. Status: DEP is currently developing Long Term Compliance Plans (LTCP) for ten New York City Waterways as well as a citywide LTCP, the first of which will be completed in 2013 and all of which will be finished by 2017. 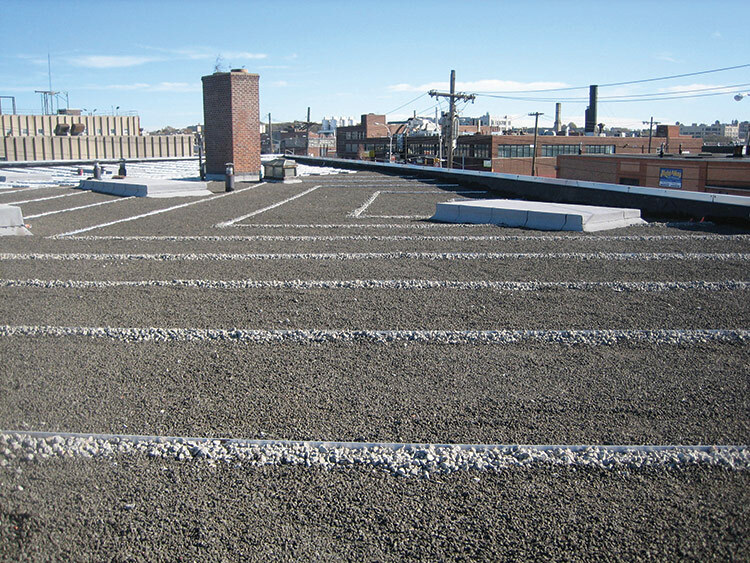 DEP is also expanding gray and green infrastructure throughout the city—including bioswales, and green and blue roofs—moving from pilot projects to larger scale implementation. On July 1, DEP mandated a ten-fold increase in the amount of stormwater that must be retained on site for all new construction projects, dramatically reducing stormwater flows. 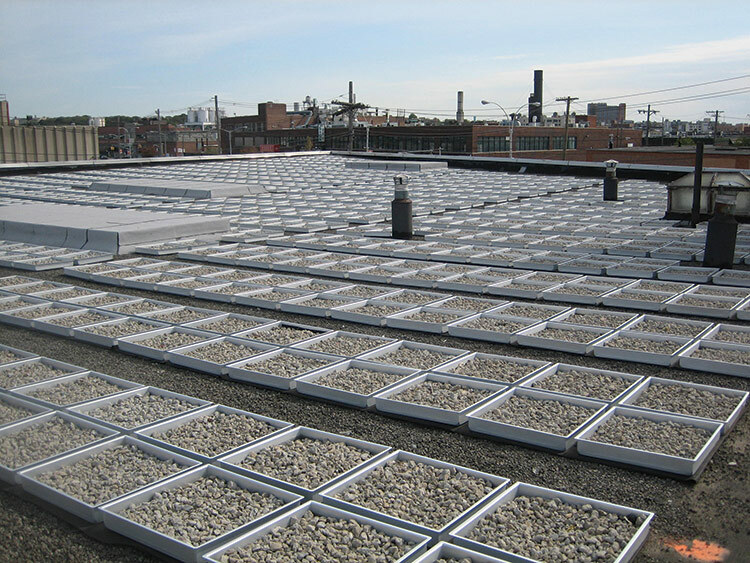 DEP worked with the real estate and development community to create flexible options for retention systems, including pervious surfaces, green and blue roofs, storage tanks, and recycling systems. Cleaning New York’s waterways, from the Gowanus Canal to New Town Creek to the Bronx River, will also open up desirable waterfront sites for redevelopment. Investing in green infrastructure will in general benefit the development community, according to DEP Commissioner Carter Strickland. 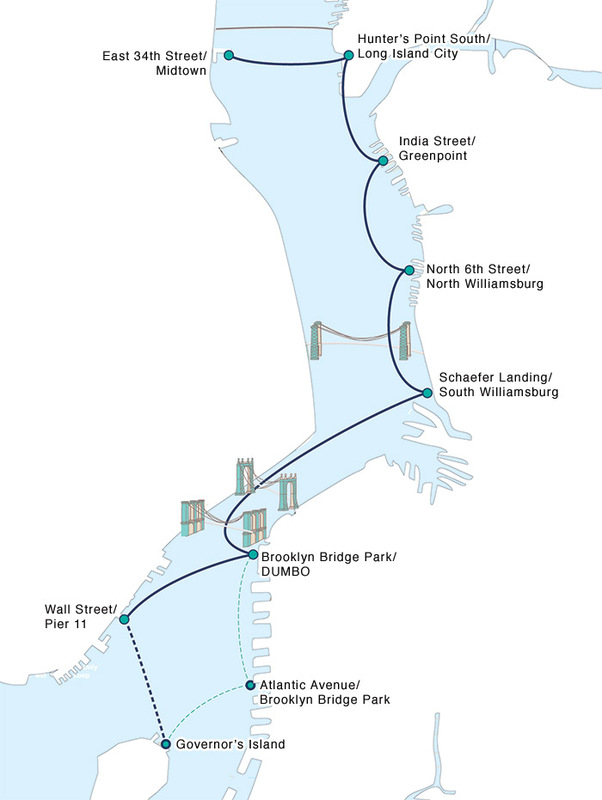 East River Ferry Route (left; click to enlarge) and a ferry navigating the East River (right). 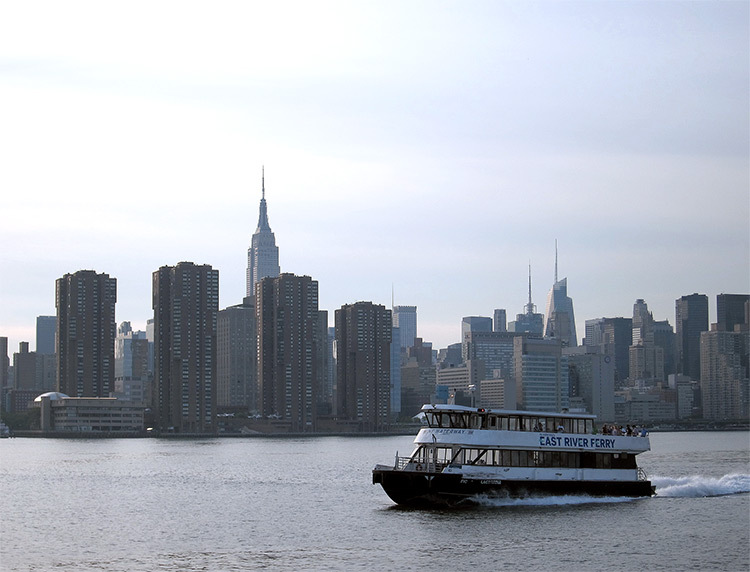 Status: A three-year pilot program for East River ferry service connecting rapidly developing sites in Manhattan, Brooklyn, and Queens including Hunter’s Point South and the Williamsburg waterfront launched in June 2011. 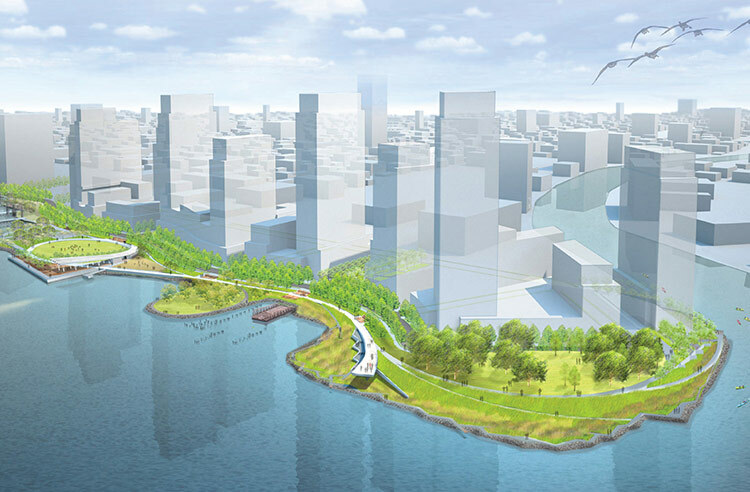 The public-private partnership is part of Mayor Bloomberg’s Waterfront Vision and Enhancement Strategy (WAVES) calling for sustainable development along New York’s waterways. Initial projections estimating 409,000 annual trips were shattered as over one million rides were logged in just over a year of service. Responding to the popularity, private ferry operator, the BillyBey Ferry Company, began offering local food options on all of its 149-passenger ships and launched larger, 399-passenger boats on weekends. Left to right: One57; The Sheffield; The Willow; 50 West Street. I’m so glad you could make it to my microhousewarming. Ha-ha, no, there’s still going to be a lot of fun, I’m just calling it that because of how much I’m loving my new Kips Bay-area, Bloomberg-administration-ordered, 275-square-foot microapartment. You can put your coat right ... there on your shoulders! Please keep your coat on. One of Gerald’s friends brought a hat, so unfortunately space is a bit tight in the closet. With stalled development undermining its public/private funding model, the Hudson River Park does not generate enough income to pay for maintenance and infrastructural problems. 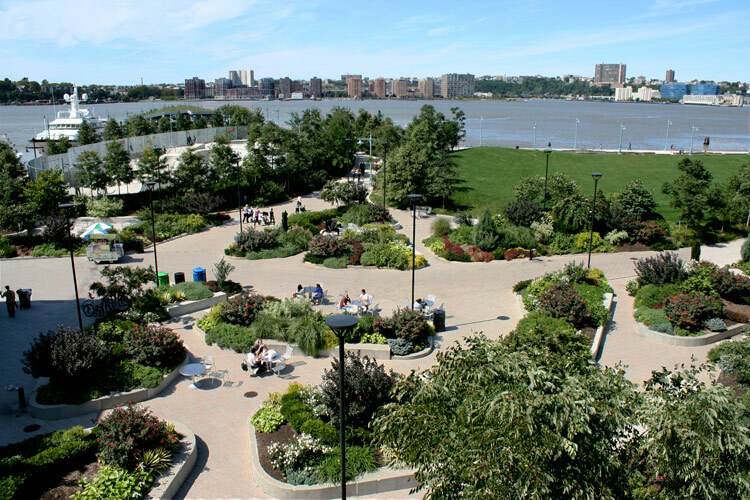 Greening the city has meant a glorious and historical expansion of its parks and waterfront amenities. But building new parks is far more complicated than planting bulbs and bushes. And even as the city has demonstrated great initiative in creating new parks, how it plans to maintain them—physically as well as financially—is far more uncertain. Caitlin Blanchfield takes a stroll through the variegated schemes for keeping up New York’s parks and esplanades. New York City is currently in its greatest period of park expansion since the 1930s. 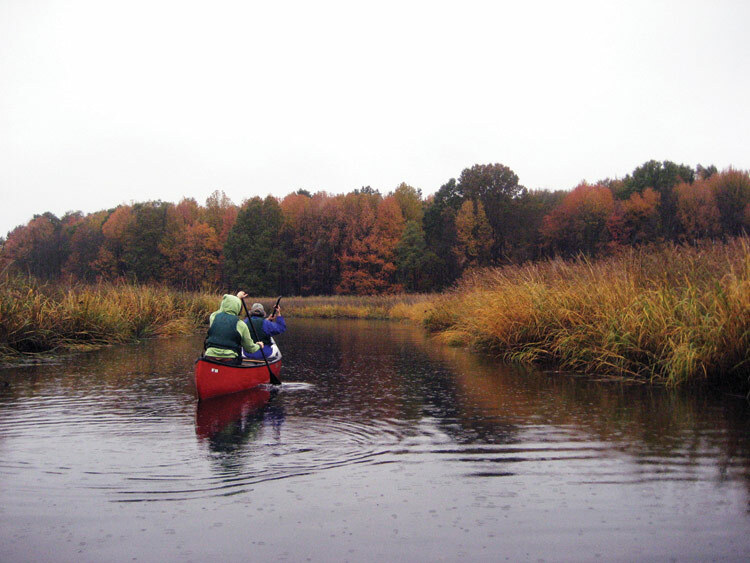 With 29,000 acres of land already in the stewardship of the Parks Department, tracts flanking the Hudson and East Rivers are being turned over to green space, restored wetlands, and recreational use. Where once there were rotting piers and toxic sludge, New Yorkers kayak in the Hudson and schoolchildren catch (and release) sea horses under the Manhattan Bridge. As Nancy Webster, executive director of the Brooklyn Bridge Park Conservancy, put it, New York’s new parks “redefine an understanding of local geography and provide a unique sense of place for New Yorkers” by recapturing its identity as a port city. Cutting the ribbon is one thing. Keeping a park usable, healthy, and engaging for decades to come, quite another. Capital projects far outstrip park maintenance in the City’s budget. According to Parks Commissioner Adrian Benepe, the budget for capital projects, which includes opening new parks and restoration projects that require heavy construction, is around $1.6 billion annually. The maintenance budget, which is dedicated to horticultural care and facility upkeep, is around $300 million. Hampered by non-starter RFPs, Pier 40 still needs $100 million in repairs (left). Hudosn River Park’s popularlity has influenced waterfronts in cities as far away as Paris and Sydney (right). 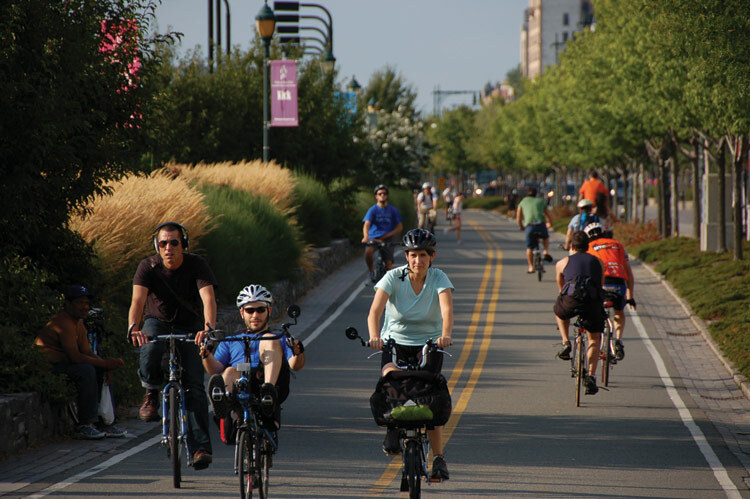 With city and state funding providing just under 65 percent of current maintenance and operation budgets, ensuring that parks are properly maintained has fallen to strategic alliances of privately interested citizens and varying models of public/private partnerships committed to overseeing long-term sustainability and funding. While some, such as the Hudson River Park Trust and the Brooklyn Bridge Corporation are legislated entities, many other organizations, like friends groups working in small community parks, are entirely voluntary, leaving the places they steward at the whim of charitable resources. “Maintenance and operations have a separate and vastly smaller stream than capital projects, yet capital design has no knowledge of maintenance and operations funding, which should dictate design strategies, ” said Deborah Marton, senior vice president of the New York Restoration Project. Approaching its 35-year anniversary, the Central Park Conservancy is a paragon of success for public/private partnerships. In the late 1970s, slashed budgets and municipal neglect had rendered the park both dangerous and in catastrophic disrepair, at which point concerned citizens banded together and formed the conservancy. Since then it has raised $650 million and developed a sophisticated system for managing its 843 acres. The key, said Conservancy president Douglas Blonsky, “is total vigilance.” Central Park is lucky. As Blonsky readily admits, it is the backyard of New York’s wealthiest residents and has a profile higher than any other park. Of a more than $42 million operating budget, 85 percent comes from the prosperous patrons who are stacked in the high-rises framing its perimeter. Such a model is simply not plausible in places without the density and affluence of Central Park’s constituency. “There is no one model that works; it’s not one size fits all. There can only be one Central Park Conservancy,” said Benepe. The parks commissioner advocates for entrepreneurship, saying that funding alliances arise organically to creatively meet the needs and conditions of each park. 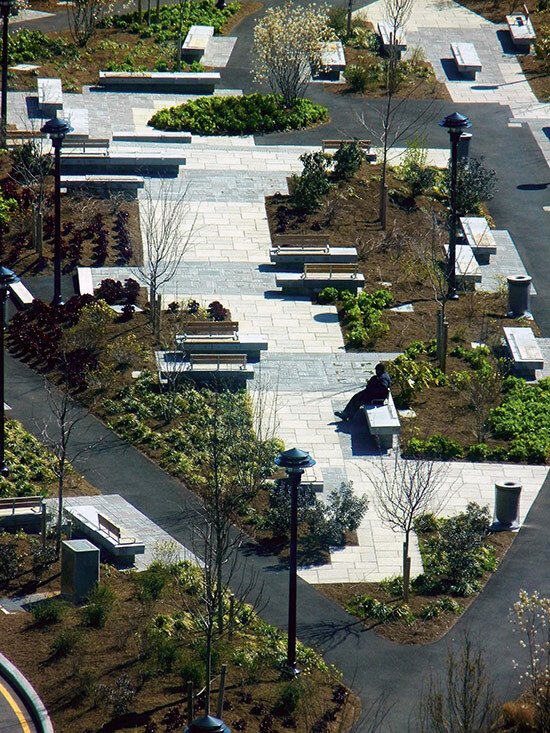 In the city’s recent park projects, that spirit has had a decidedly development-friendly bent. Brooklyn Bridge Park and Hudson River Park, both waterfront sites with complex programs incorporating recreation, leisure, and environmental remediation, have gone the way of rents, not altruism. 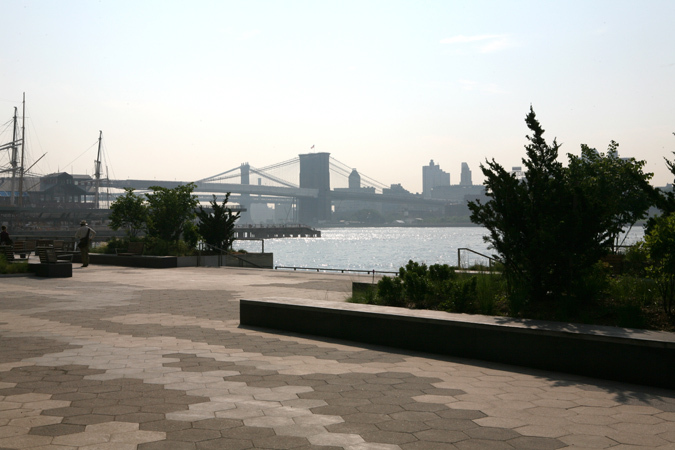 Hudson River Park includes a popular cycletrack that serves as an artery for the city's cyclists. 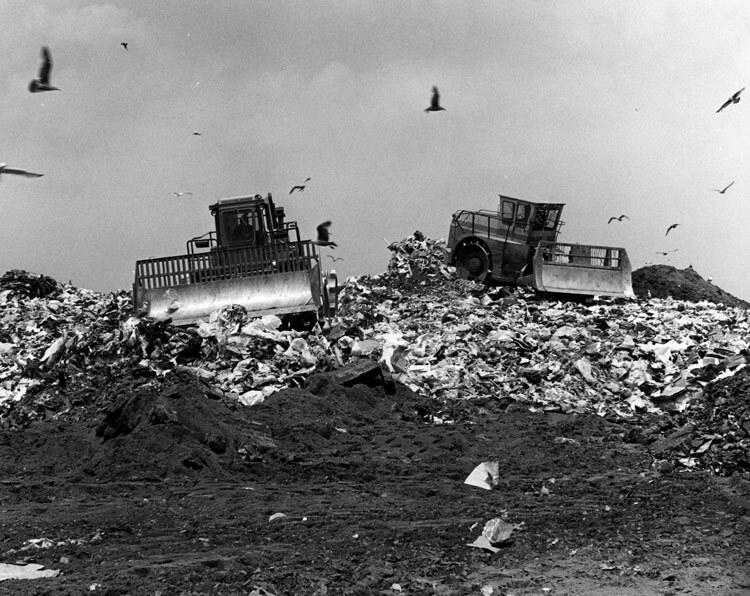 Freshkills park as a landfill in the 1990s. 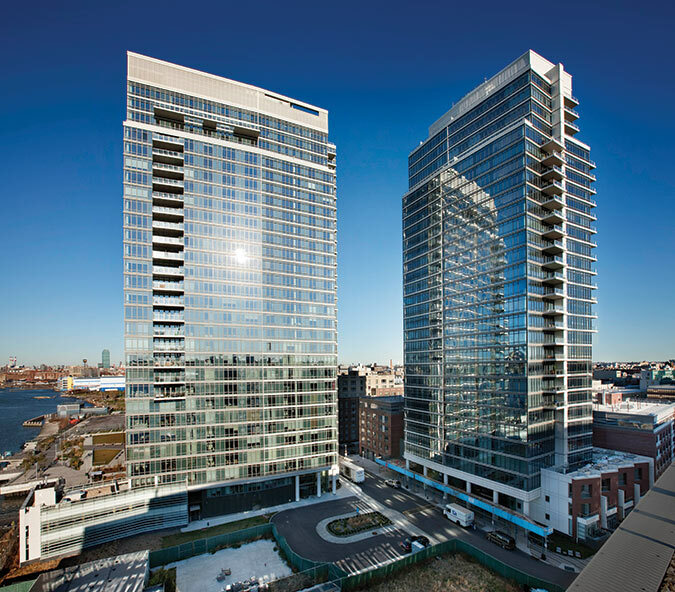 At the southern tip, One Brooklyn Bridge Park is a luxury condominium complex with waterfront views and ground-floor retail (first store to move in: a dog spa). Since its completion in 2008, it has netted $14.8 million dollars, which has funded all park security, maintenance, and waterfront infrastructure costs. 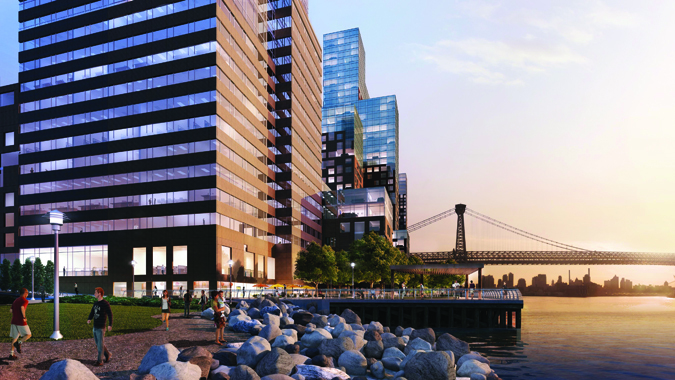 As the park continues construction, a hotel and residence will go up on Pier 1; two residential buildings are slated for Pier 6. Retail development on Water Street and John Street in Dumbo will also augment commercial revenue. In part, this blend of private development and public space arose to meet the unique needs of the site: the pilings on which the park is built are subject to deterioration from salt water and aquatic microbes and must be checked every three years. As the river regains its vitality—the result of industry decline and waterfront greening— and teems with healthy, hungry critters, these pilings will need more frequent assessment and replacing. Reinforcing pilings on Pier 5 in concrete totaled $11 million. According to Nancy Webster, revenue from commercial development has been a successful stream of income, capable of footing the self-sustaining maintenance and operations bill so far. With the first review since 2008 on the horizon, she predicts the model will continue to function, so long as the hotel and apartments bring in projected profits. Currently, negotiations are underway with developers for hotel and residential development on Pier 1. Retail locations on John Street in Dumbo and Pier 6 are still undeveloped, and the development corporation is looking into alternative revenue sources from the sale of properties near the park now owned by the Watchtower Bible and Tract Society of New York, Inc., which would have to take place by the end of 2013. At the same time, portions of Piers 3, 4, and 6 remain unfunded, their future uncertain. “One advantage to our model is that we will have capital reserve for unseen maintenance emergencies. We will have funds to react as things come up. 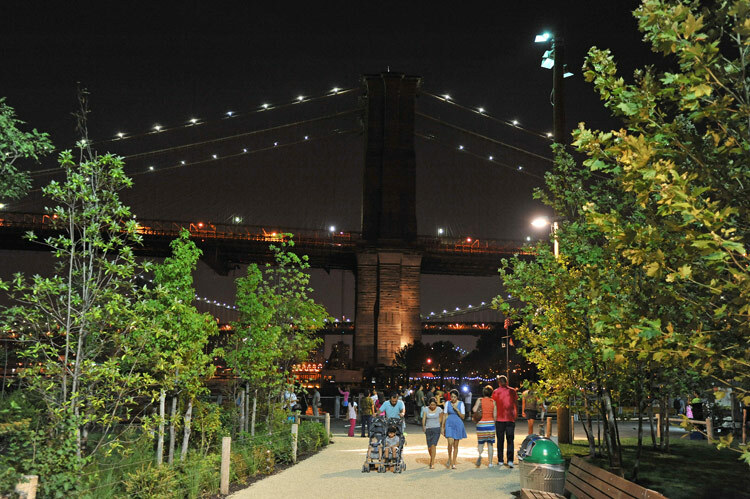 In other parks when emergencies arise, the city cannot fix them in a timely fashion,” said Regina Myer, president of the Brooklyn Bridge Park Corporation. From shipping hub to hip adress, Brooklyn Bridge Park supports commercial development on ten percent of its 1.3-mile length (left). picturesque wood piers in Brooklyn Bridge Park need to be replaced as aquatic borers increase with healthier waters (right). Across the river and on the west side of Manhattan, Hudson River Park faces such a predicament. The legislation that enacted Hudson River Park as a city- and state-owned entity in 1998 has proved too limited to allow for the kinds of development that would net the necessary funding. The issue at Hudson River Park is twofold, explains Madelyn Wils, the Hudson River Park Trust’s executive director. With two piers still undeveloped, the Trust does not have the income it anticipated when the act was first created. Unforeseen infrastructural problems are also proving a drain on the budget. For instance, the bulkheads on top of which the park is built and that hold up Route 9A (the Westside Highway) are costly to shore up; many of them failed to withstand Hurricane Irene last summer. Moreover, wooden Pier 40 is fast decaying after plans for its development were halted in 2006, when the Trust was unable to find a developer or development plan that met the stipulations of the Hudson River Park Act. Compared to the uses at Brooklyn Bridge Park, the act is narrow, excluding housing, commercial office space, hotels, and manufacturing. What was likely intended to protect the waterfront from overly privatized development has left the Trust in a quagmire of dead-end Requests for Proposals (RFPs). 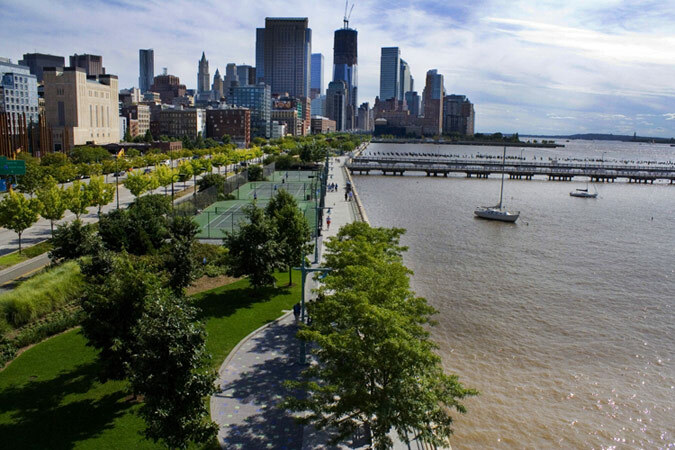 Currently the park, which stretches from Midtown to Battery Park, allows commercial maritime and ferry ports, entertainment, retail, and commercial recreation. But, according to Wils, respondents to RFPs have rejected those uses, leaving the trust in search of viable commercial development in the park, and looking to make marinas or generate commercial activity in the water itself. 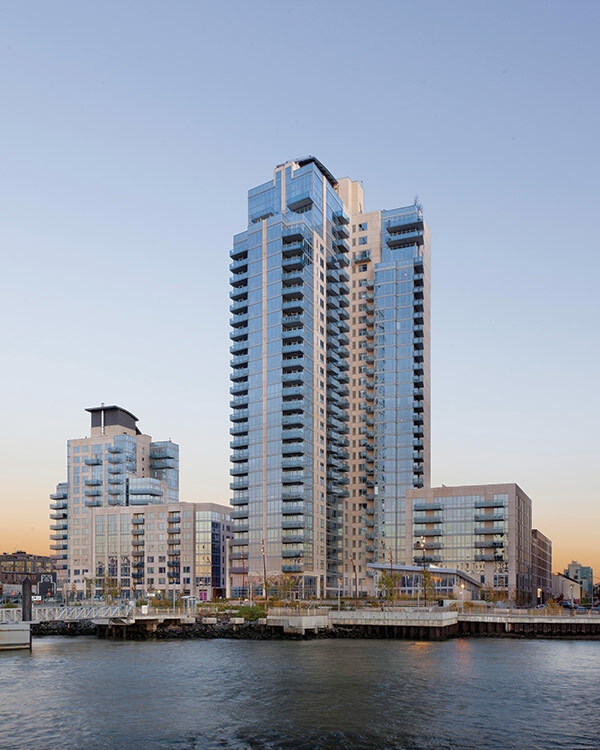 Exacerbating these financial strains, Chelsea Piers, tenants on three piers from 17th to 23rd streets, are suing the Trust to repair damages caused by marine borers over the past 20 years. On Staten Island, Freshkills aims to be the next generation of parks offering passive and active recreation, native species, and innovative funding, such as harvesting methane for sale from the landfill beneath the meadows. 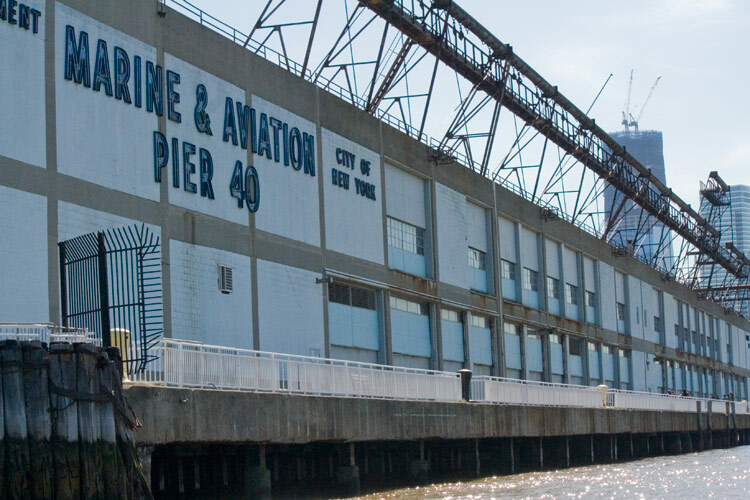 According to the Pier 40 Development Feasibility Study by HR&A Advisors and Tishman/AECOM, released privately in May, Pier 40 needs about $100 million in repairs. The report found that the best source of ongoing income—adding the least traffic impact—would be 600 high-end rentals (as the Trust cannot sell its property) and a 150-room hotel. Other revenue-producing ideas under exploration include tax-exempt bonds and the more controversial Park Improvement District. When created, the Trust was envisioned as an exemplar for in-water parks—influencing waterfronts in cities as far away as Paris and Sydney—but that has also exposed the park to unforeseen costs, such as retrofitting the decaying piers that are fodder for marine borers and battered by wind and brackish water. “Twenty years ago no one knew healthier water would mean more voracious aquatic borers, so you can’t build with wood. We’ve learned, for example, you have to use certain pavers to withstand water pressure from the currents,” Wils explained. Renting out berths for ferries and commercial cruise ships have racked in rent, but not enough to assuage these unpredicted high costs. On Staten Island, Freshkills, the Parks Department most recent and expansive project, opening to the public later this year, must navigate not only an aquatic site, but also one atop a former landfill. Unlike Brooklyn Bridge Park and Hudson River Park, Freshkills— at 2,200 acres, three times the size of Central Park—does not have any trust, corporation, or conservancy in place to fund its annual operations. 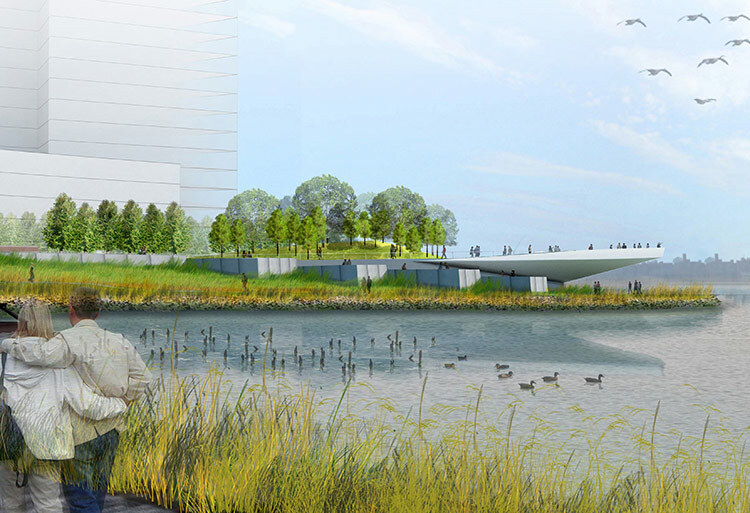 Not easily accessible by foot or subway, Freshkills is no magnet for the types of public/private partnerships that make other waterfront parks financially self-sustaining. 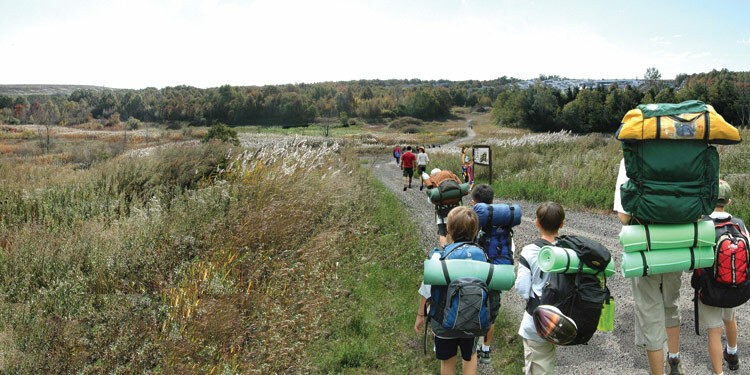 According to Tara Kiernan of the New York City Parks Department, Parks is establishing a nonprofit Freshkills Park Alliance to fundraise for the park. At 2,200 acres, Freshkills, here in a rendering by James Corner Field Operations, is three times the size of Central Park (left). Urban kayaking is a popular in-water activity at all New York’s waterfront parks (right). To be built out over the next 30 years, Freshkills represents the next generation in experimental models for how a park can coordinate a complex program of restoration, recreation, concessions, and passive enjoyment, almost all within the city’s budget. Using active landscape design guidelines and the insights of 21st-century landscape architecture and responding to community input, Freshkills has been designed by James Corner Field Operations as a sustainable landscape using native plants and restoring natural habitats that, as long as healthy, will maintain themselves—and hopefully prevent it from meeting the same fate of Flushing Meadows Corona Park, where a pastoral park with shade trees and lawn grass built in the low-lying lands near Flushing Bay was overtaken by salt grasses and invasive species. Capitalizing on less-than-idyllic site conditions, the sanitation department is already harvesting methane gas from the landfill below Freshkills, which it is selling back to National Grid, generating $12 million in revenue for the city. The park is also partnering with research institutions and local universities to investigate water quality, soil restoration, habitat restoration, and reforestation, among other environmental issues, opening up opportunities for grant funding. 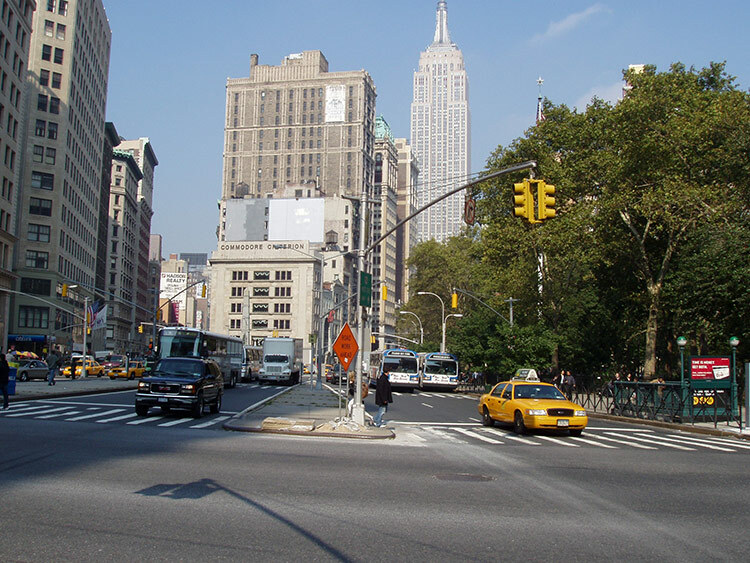 New York Department of State, Division of Coastal Resources, and the Federal Highway Administration have thus far contributed $12 million to the project. 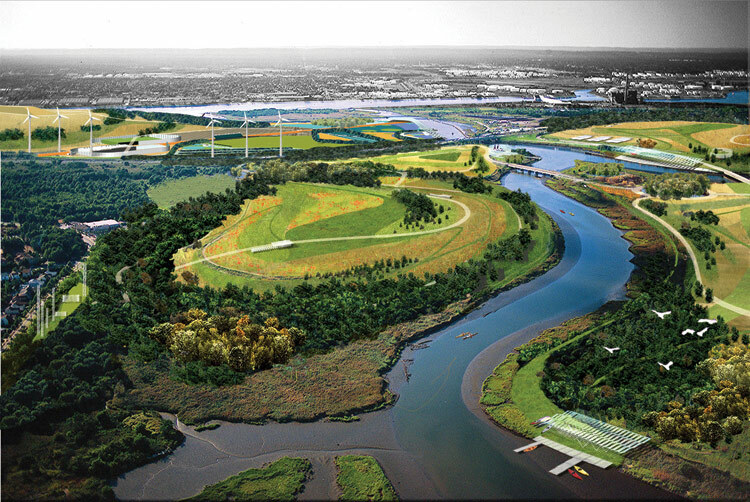 While such initiatives dynamically wed stewardship and financial sustainability, they are but a drop in the bucket considering that Freshkills master plan has a $100 million price tag—in part so high because of the cost of remediating landfill seepage. As construction is still so heavily underway, the park has yet to determine its future maintenance budget. As landscape architect and Columbia University professor of landscape architecture Kate Orff points out, “Maintenance is a park.” And parks that go unmaintained have the potential to do more than just becoming unkempt; they can be dangerous. Parks budgets have been downsized 30 percent, according to Wils of the Hudson River Park Trust. Parks Commissioner Benepe voices concern about how parks will be able to retain funding in the future. As great parks projects continue to roll out, it’s essential to pair a zeal for creating public space with an even greater dedication to keeping them safe, accessible, and vital for the long run. 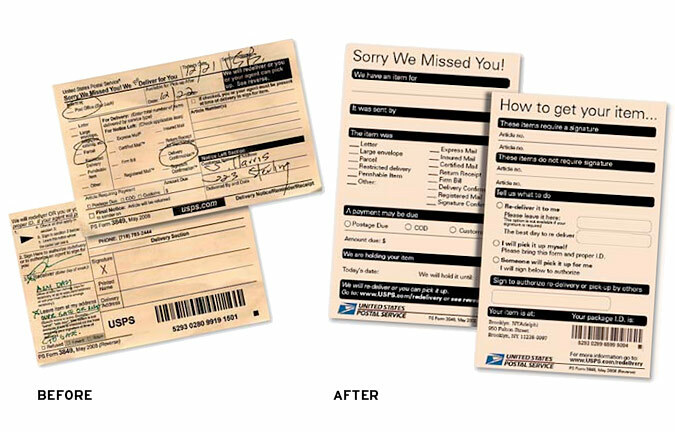 A design comparison of a delivery notice from the U.S. Postal Service. Going to the DMV is nobody’s idea of a day at the park, but the emerging field of service design aims to change that. The Brooklyn-based nonprofit Public Policy Lab (PPL) incorporated last year with the goal to improve interactions between public services and those served by them through research, advocacy, and technical assistance. Explained PPL executive director Chelsea Mauldin, “At the DMV, it’s important to look at how we interact with the created artifacts of that service—the physical space, the forms, the actual driver’s license. There’s a sequence of service steps you encounter.” By studying these interactions, service designers can decipher the strategic goals of public policy and improve efficiencies between the public agencies and their audience, while also saving money. PPL’s first major initiative is a collaboration with the NYC Department of Housing Preservation and Development (HPD) and Parsons’ new interdisciplinary service design program, the DESIS Lab. Following a scoping meeting in late January, the team will spend a year studying how the agency interacts with its clients—developers, property owners, and residents—to recommend pragmatic and implementable design ideas. “This is an out-of-the-box collaboration,” said Kaye Matheny, the HPD assistant commissioner for strategic planning. “We’ll be evaluating how people engage with HPD—what are our touch points across the city, how do they engage with us, and how do we improve that?” A second phase of the partnership will study the impact of HPD’s providing over $8.7 billion to neighborhoods since 1987. “We want to understand how our investment has shaped and defined neighborhoods,” said Matheny. Achievable recommendations could begin implementation next year. 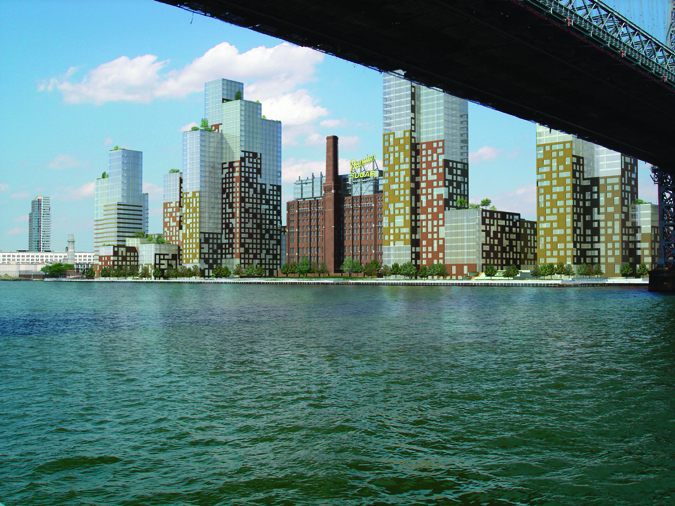 A last ditch effort to stop development at the Domino Sugar refinery fell through on May 25 when State Supreme Court Judge Eileen Rakower dismissed a lawsuit filed by the Williamsburg Community Preservation Corporation. The group claimed that the project’s developer, the Community Preservation Resources Corporation’s (CPRC), along with Department of City Planning and City Council, did not conduct the proper land use and environmental reviews. 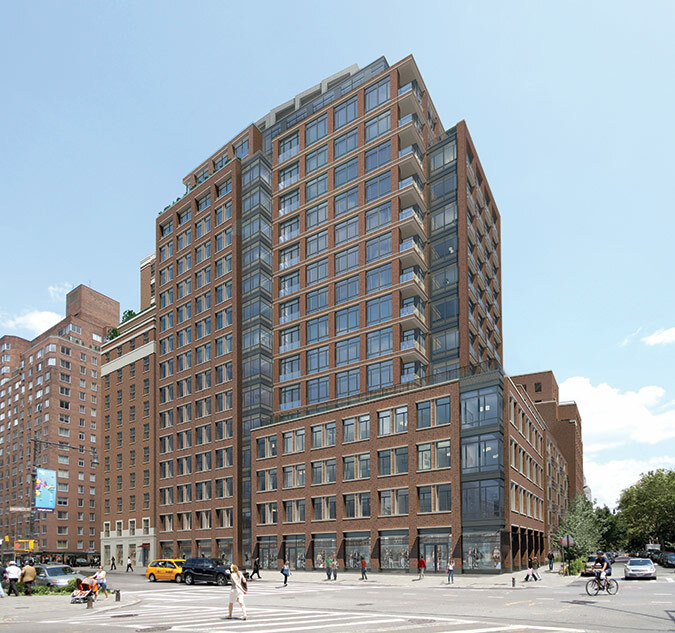 Though City Council-member Steve Levin opposed the development, he was pleased to see the lawsuit dismissed. “The accusations in the lawsuit were unfounded,” said Levin. “It named the City Council as a respondent, and it seems pretty clear to me that the Council didn’t act in an arbitrary or capricious manner. So I agree with the ruling, but that doesn’t negate that I still have issues with the project.” Levin said that the density and height of the proposed complex would stress the area’s overburdened transportation and infrastructure. Levin held out the hope that East River Ferry Service launched on June 14 might alleviate some of the commuter congestion. It’s an idea that has been floated before, but seems to have gained momentum with New York City Economic Development Corporation’s (NYCEDC) pilot program. There are already stops north and south of the site at North Sixth Street and Schaefer Landing. CPRC Vice President Susan Pollock said the developer has been in contact with NYCEDC. “As the demographics change we hope to have a stop at the project,” she said. Before any crowds, the money must be found. Pollock said that while developers were “having a lot of productive conversations” regarding some $2 billion in financing, legal issues are complicating matters. 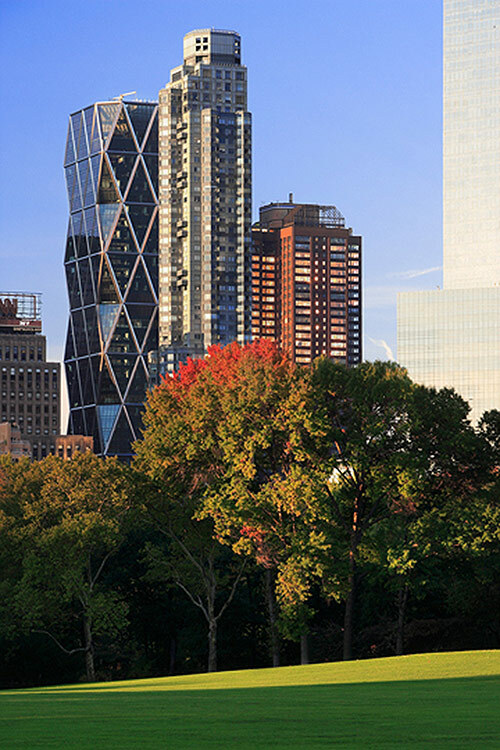 For Viñoly, there are certain priorities within the plan. “It’s very important to complete the waterfront park, and that will make a huge difference in how the project is read,” said the architect. Pollock agrees, noting that the developers invited members of the community to the site for an event and was surprised to hear how many had never seen the view. “It was astounding the number of old timers who have never before been to the waterfront there,” she said. “The site runs along five streets that stop dead at Kent Avenue. It is very important that it integrate into the community.” The new plan extends the streets onto the property, culminating on a great public lawn overlooking the East River and Manhattan skyline. Pollock said that the project is on target to start construction in 2012. 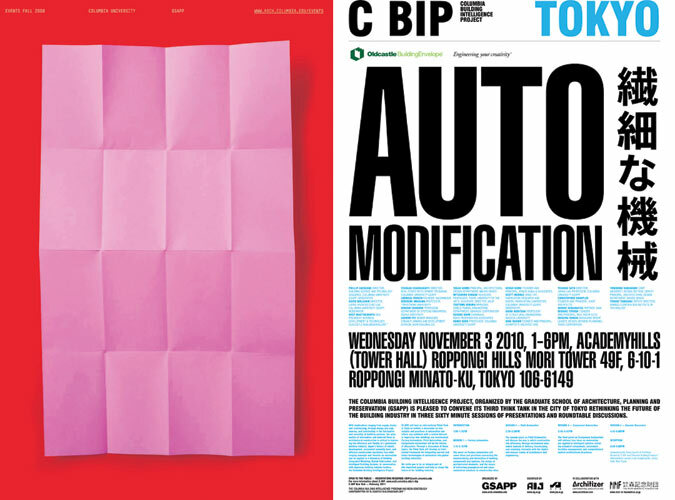 Stefan Sagmeister designed the poster for the 2008 fall lecture series at GSAPP (left) and the poster designed by 2X4 for the Columbia Building Intelligence Project held in Tokyo in 2010 (right). The fact that schools of architecture repeatedly pull off great events is nothing new. Frank Lloyd Wright’s famous 1951 lecture at Columbia has been meticulously archived; Harvard’s annual Walter Gropius lecture has been given by one of the most established practitioners in any given year since 1961. Nor is it uncommon for schools to deliberately organize provocative conferences as when Yale fostered a real ideological battle in a public forum between Peter Eisenman and Leon Krier in 2002. As recent history has demonstrated, interesting debates and critical experimentation are no longer the purview of agents like the IAUS—established in the 1960s as an alternative to the institutions mentioned previously—which are again returning to university culture. As Rem Koolhaas insists at his academic lectures, architectural ideas have a broad audience beyond captive student audiences conven-iently dwelling in studios adjacent to the university auditorium. At the same time, I believe that the production of architectural events in universities is more and more of a curatorial act. In addition to the professors and deans traditionally involved, more engaged administrators are not only coordinating and organizing events but also giving input and direction. The need for additional curation is clear, these events are occurring at a sometimes dizzying rate, with a typical week consisting of a Monday night panel discussion on sustainability issues in China, a Wednesday evening architecture lecture by Richard Rogers, a Friday lunchtime debate on urban zoning policy, and a Saturday conference on African cities. Furthermore, the ability and desire of these ambitious events to draw outsiders—practitioners, retirees, artists, policy makers, students from other schools and faculties—has an indelible impact upon the school’s students, faculty and discourse at large. In producing programming, not just in the form of events but also exhibitions, publications, and relevant web content beyond that with an academic link, a school can instigate discussion and inspire collaborations that reach beyond the existing culture of the place. What does it mean for schools to have such overactive public programs? It seems obvious: to serve the students and faculty and to give them avenues in which to communicate about their work. However, public programs should not simply replicate the school’s agenda but also help to produce it. By creating venues, forums, and mediums, schools can explore what it they are curious about outside the classroom. In turn, ideas that come out of an academic event should influence the school, shape its pedagogy, and sway its discourse. By inviting other interests in and producing friction with diverse ideas, the school can better define how it thinks about itself. At Columbia GSAPP, where I have directed the events program for the past six years under the direction of dean Mark Wigley, we have strived to create such conditions by blurring the lines where classroom, practice, industry, and professional development can meet, as in the conferences on materials, including glass, concrete, metals, and plastic, chaired by professor Michael Bell. Of course, it has been a challenge for design schools that have departments in addition to architecture, such as urban planning, urban design, historic preservation, landscape architecture, and real estate development to produce public programs that address the interests and concerns of all included. Architecture departments tend to take a minimum of three years to complete and therefore have the most students. But a well-curated program can facilitate interaction amongst all departments and instigate curiosity about other disciplines, mirroring the cross-disciplinary approach currently favored by the profession. For example, the architecture student who comes to developer Douglas Durst’s talk may begin to understand that convincing his peers in the real estate development program that good design is a good investment may someday lead to a commission—just as listening to Steven Holl discuss housing projects in China might lead a research trip to Shenzhen to examine the existing urban fabric, or a discussion with Amanda Burden about New York’s planNYC might inspire a debate among urban planning and architecture students that could lead to a proposal for a joint design-development studio. Crafting a communications plan for announcing and informing diverse publics within and beyond the school is a constant challenge. Whereas museums have long-term planning in their DNA, schools have not been traditionally accustomed to organizing themselves this way. Their fluid and experimental nature can throw this process. Attention to mailing lists and email listserves is not often a priority, undermining the programming or outreach ambitions. Schools tend to be omnivorous when it comes to their visual identities. They have a wonderful way of promiscuously working with a host of graphic designers. Whereas cultural institutions aim for consistent branding, a school can choose a sober design approach for one exhibition, while the same school’s lecture series poster might be outrageously bright. These posters, programs, and postcards are sometimes the only traces remaining of significant events and become somewhat collectible. A well-detailed program for a conference can essentially become the Cliff Notes for the audience or the table of contents for the symposium publication. The events program that I directed at Columbia was well received but did not go unchallenged. I noticed that event fatigue can set in. Complaints came from professors that there were too many programs on too many nights with not enough time to think in between. Students created their own rogue series advertising that they would invite the people “they choose” rather than the speakers chosen for them, and they sometimes stopped attending even the most compelling school lectures. The effort to produce creative and graphically stimulating communications materials was also met with contentious remarks from faculty and students who felt that the designs were sometimes too confusing or too colorful, while others considered them not bold enough. Then again, alums sometimes write to tell me that they are using past posters as decoration on their office walls! No matter how ambitious a series is, it cannot satisfy everyone’s interests. An embarrassment of riches and offerings is not a bad problem to have. One can only hope that by offering up such a diversity of ideas that there is always something with which to engage. Sometimes an event on a particular scholarly subject that draws a modest audience of 25 engaged attendees can be just as worthwhile as a lecture by a famous architect filling the auditorium with 300 people. Having recently been appointed the Assistant Dean of Communications at Harvard University Graduate School of Design, I step into a role with a communications mandate at its core. The position oversees an already creative and experienced team running the departments of events, exhibitions, publications, Harvard Design Magazine, and web content. Under the direction of the Dean Mohsen Mostafavi, the goal is to give more possibilities for interdepartmental collaboration and broader reach and impact. In a time when museums have dwindling departments of architecture, curatorial positions in architecture are few and far between, and cultural institutions are cutting back on architecture programming, it is more important than ever for schools to take their role seriously as major producers of architectural discourse. To produce material that is accessible within academic walls and also reaches out to the profession not only serves the school, but the entire community. 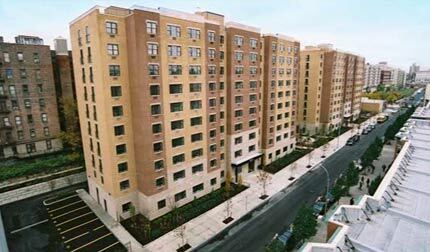 The Briarwood Organization recently completed the Solara in the the Bronx but has had trouble filling it because banks are reluctant to lend to buyers. As part of a complex deal with the federal Department of Housing and Urban Development, the state, and private groups, 21 of the city's most dilapidated public housing complexes finally became eligible for annual federal subsidies today, as well as an investment of more than $400 million. The deal is one of many helping to keep affordable housing afloat during the downturn, as chronicled in the following story from Issue 05. Whether it is the past boom or the recent bust, affordable housing seems always to be in urgent demand. During the good times, rent-controlled and rent-stabilized units vaporized, and now sky-high rents have still not come back to earth. Lockwood was referring to the New Housing Marketplace plan, updated on February 22. The centerpiece of the Department of Housing Preservation and Development’s affordable housing efforts, the plan was first laid out in 2002, and greatly expanded in 2005 on the eve of the mayor’s first re-election. It called for 165,000 units for some 500,000 residents by 2013, half of which would be created through new construction, often within market-rate developments, half through preservation of existing affordable units. The mayor announced that the program was indeed on track (with just under 100,000 units so far), but it will now take a slightly different tack, emphasizing retrofits and preservation over construction. In spite of the plan’s continued success, it is not immune to the current economy: Keeping it afloat will cost the city an additional $1 billion, and the completion date has been pushed back to 2014. Holly Leicht, Deputy Commissioner for Development at HPD, sees these changes as a virtue, not a failure. The city initially capitalized on new construction, leveraging inclusionary zoning and tax credits to entice developers to build in affordable units to their new "luxury" projects. With construction credit still frozen, almost no units are being created through this route, so the department has shifted its money to the other half of the equation, preserving units through tax credits and low-interest loans. “A lot of owners, particularly in Mitchell Llama housing, may have seen a pot of gold before, but now that pot of gold is gone, and they are much more interested in talking to us,” Leicht said. This is an especially enticing approach for the department because it has already committed heavily to such developments. Keeping them affordable now extends that investment. It also has a faster turn around than new construction, where many promised units remain unbuilt. “It’s taking longer, but we always anticipated this would be a long-term strategy,” she said. Still, Leicht said she believes the worst is over, and the department still managed to realize 12,500 affordable units last year, down from a high of 17,500 in 2008. New programs have also sprung up to help the city in its quest for more affordable housing, though they are experiencing varying degrees of success. The city has received two rounds of Neighborhood Stabilization Program funding from the federal government, which uses innovative data-tracking to fund small-scale projects, from homeownership assistance to foreclosure purchasing, helping head off the sort of disinvestment that plagued the city in the 1970s and ‘80s. One program that has yet to bear fruit, however, is one of the most celebrated, at least by the politicians who created it. With upwards of 600 stalled construction projects in the city, City Council Speaker Christine Quinn proposed the Housing Asset Renewal Program, or HARP. The program, announced last summer, would use city money to provide bridge loans to stalled projects, with $25,000 to $50,000 provided for each unit the developer converted to affordable housing. The goal was to create about 400 affordable units. So far, none have gone ahead. A deadline was originally set for December, but it was pushed back to April for lack of quality bids. Leicht said there are better offers coming in now, with more variety—not just small projects in the outer boroughs. The problem remains that few lenders, even with foreclosures in the offing, are willing to take the necessary discounts the program demands. As with most problems since the collapse, blame has fallen on the bankers. James Riso, a principal at affordable housing developer the Briarwood Organization, said he used to close two to three apartments a day in his projects but is now lucky to see that many a month. Meanwhile, most developers are holding on, so competition remains fierce for the few affordable ground-up projects out there, forcing Briarwood to do more construction management, which is actually where the developer has it’s roots. “We’ve come full-circle,” Riso said. "You have to adapt to your circumstances." Habitat for Humanity has, it has actually been prospering. It recently partnered with New York State to develop super low-interest mortgages for homeowners. With the proceeds, Habitat is now able to take out construction loans for the first time, expanding its building program. The group has also been negotiating short sales to keep buildings occupied and using its volunteers to clean up community centers and parks, making distressed neighborhoods less so. “Now’s the time to get creative,” Lockwood said. The city's proposal envisions apartment towers and waterfront open space as a focal point of the Lower Concourse rezoning. concentrations of art deco architecture in the world. But not all of the great boulevard’s five miles are so distinguished. Along the southern tip, stretching from 150th Street to the Harlem River, gas stations, auto body shops, and disused lofts predominate, remnants from the area’s industrial past. 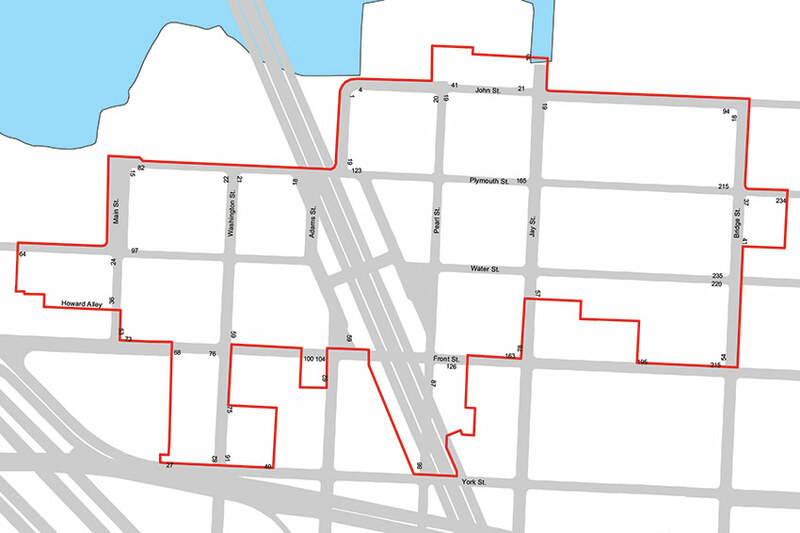 A map of the recently approved rezoning. The city hopes to transform the area's disused waterfront. Historic loft buildings will be preserved, some as residences, others as factories. Now, the city hopes to transform this stretch of Mott Haven into a modern-day, mixed-use, mixed-income community—a 21st-century version of Risse’s vision—through a rezoning plan approved by the city council on June 30. The plan, which covers a 30-block triangle where the river bends, calls for a mix of preservation and new construction to create market-rate and affordable housing and some manufacturing, while opening up parts of the waterfront for the first time in decades. The heart of the plan transforms the lowrise industrial landscape into midrise residential lots, mirroring the eight- and 12-story apartment houses to the north. In a much bolder move, most of the formerly industrial waterfront is being given over to the type of highrise development that now characterizes the Brooklyn and Queens waterfronts, with 40-story residential towers surrounded by parks and open space. A 2.2-acre park is also planned for the upland section of the district. The Department of City Planning, which developed the rezoning plan, has set aside loft buildings adjacent to MetroNorth and the Major Deegan Expressway as manufacturing facilities that would retain so-called green-collar jobs. Meanwhile, lofts in more suitable areas will be converted for residential use. The plan uses the city’s inclusionary housing bonuses to encourage affordable housing development by offering additional density in exchange for making 20 percent of a project affordable. But Harry Bubbins, executive director of Friends of Brook Park and a longstanding critic of the rezoning, fears it could have adverse impacts on surrounding areas. “It’s the same cookie-cutter gentrification model the Bloomberg administration has deployed throughout the city,” Bubbins said. He argued there is not enough infrastructure or public amenities to support an influx of new residents. A version of this article appeared in AN_07.29.2009.